Two Sparks in the Basement hallway in the 3DS remake. 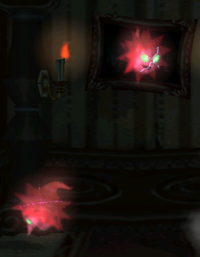 Sparks are red, explosive, spike ball ghosts who appear in the mansion hallways of Luigi's Mansion. They have a tail and pointed nose. Sparks always appear in groups of two. They emerge from walls, doors, or even a picture. There are three groups of Sparks in the game, two of which appear in the 2F Hallway. The first group emerge from the mansion picture on the far left, outside of Nana's Room. The second group emerge from a wall just before the staircase to the Safari Room. The last group of Sparks appear in the Basement Hallway, where they come out of a door leading to a short passage to the Secret Altar. Sparks automatically explode after a few seconds. If Luigi gets caught in the blast radius, he loses ten HP. Sparks also explode and injure Luigi from contact with him or being vacuumed by his Poltergust 3000. The only way Luigi can defeat Sparks is from spraying water or fire on them, although the latter makes them explode. Spraying ice has no effect on them. In the Nintendo 3DS remake, Luigi must use one of the two elements on a Spark to include it in the small ghost portrait of The Gallery. This page was last edited on January 28, 2019, at 20:06.